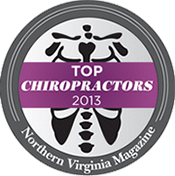 Chiropractic spinal adjustments constitute the greatest percentage of type of treatment provided in our office. The spinal adjustment is used to treat spinal subluxations. A spinal subluxations is a misalignment of a bone (vertebra) of the spinal column in relation to the one above or the one below it. When the vertebra are misaligned they don’t move properly which causes an irritation at that level of the spine. This can start as a feeling of soreness or stiffness. This discomfort can progress to a stronger or sharper pain which can radiate down the leg (sciatica) or down the arm or up into the head as headaches (depending upon which spinal level is being irritated). Irritation of the spinal nerves (peripheral nervous system) can cause those nerves to function incorrectly. Since the nerves of your body carry signals from your brain to every part of your body (telling it what to do) and also carry signals from your body back to your brain (telling you what it is doing), irritation of these nerves can cause these signals to be interfered with, causing parts of your body to function improperly. This can cause your legs to be weak, your stomach to digest improperly, menstrual cramping to be worse or blood pressure to be raised, for example. Spinal subluxations also cause earlier degeneration of the discs of the spine and earlier development of arthritis. Spinal subluxations can cause a lot of health problems not usually associated with the spine. Before we provide a chiropractic spinal adjustment, a thorough consultation and examination (often including x-rays) is performed to determine if a spinal subluxation exists and to confirm that a spinal adjustment be performed safely. Our chiropractic spinal adjustment is a gentle movement of the spinal vertebra, which is performed by hand, to carefully move the subluxated vertebra back toward the proper spinal relationship.